We arrived by 6:30 am (right on-time) into Ulaanbaatar. We walked around on the train station until we found Otgon. The Happy Camel Tour office was across the street. 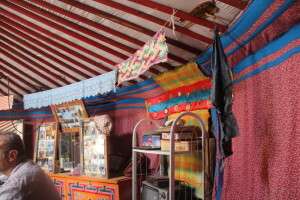 The owner was very nice and offered us some tea. We finally had Internet and were connected back with the world. The Devils had made some major changes and got our seal of approval. A driver took us from the office to the airport. The city of Ulaanbaatar appeared very dirty, but there was a lot of activity. They have nuclear power plant just on the outskirts of town. There were no American fast food joints (unlike in Guatemala) and few high rises. 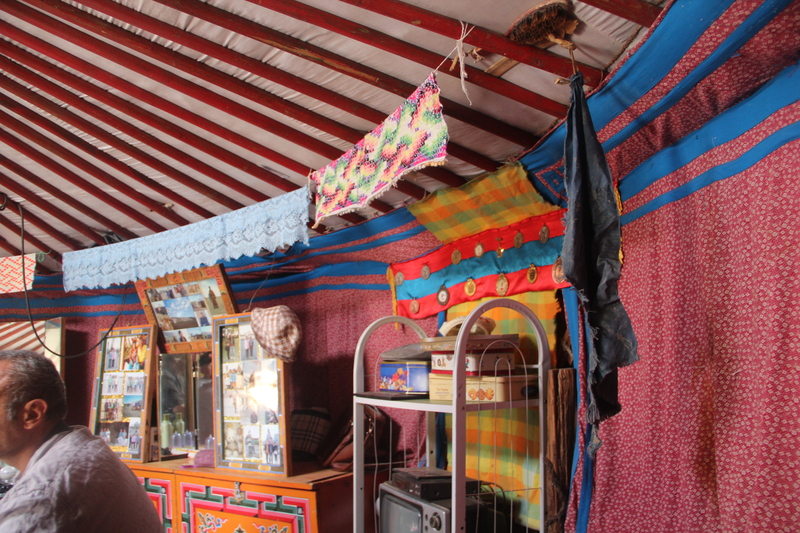 We arrived at the airport around 9:00 for a 11:50 flight down to the Gobi. We had our first real food in a long time with a ham and croissant sandwich. We got some money and were ready to check-in. We go to check-in only to find out our flight was delayed 4 hours. Thank you, Aero mongolia! I end up finding Internet at an upstairs restaurant where I could tell Happy Camel that our flight was delayed. We finally arrive in the Gobi four hours later where we met our driver. I would try to spell his name, but it would be a disaster. The cars are interesting with the steering wheel being on right side (as in UK), but people drove on the right side of the road. 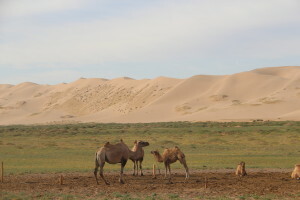 With Dad riding shot gun, we begin our four drive out to the sand dunes (Khondorln Els/ Sand Dunes). The road quickly like (30 seconds) after airport turns to dirt. 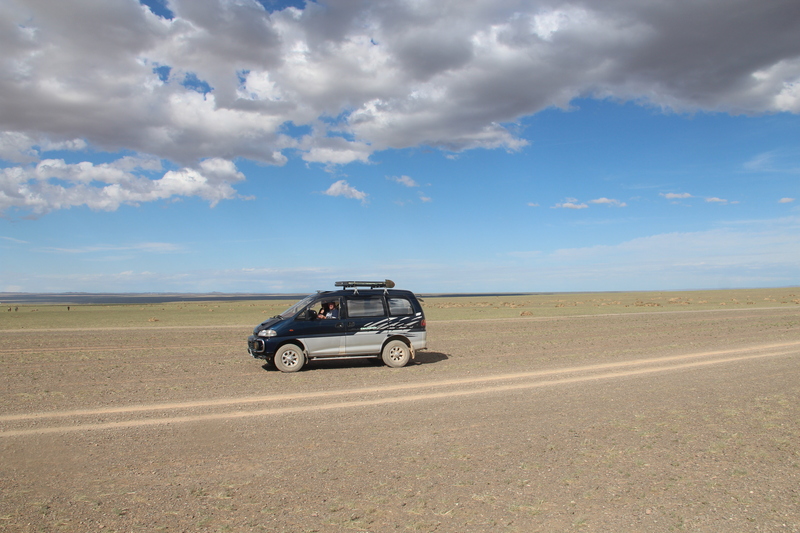 What you quickly realize is that there are no roads in the Gobi. You simply pick a direction and the odds are that there are four or five different tracks out in that direction. Most of the drive is fairly flat with some slight rolling hills. There is mountains in the distance to left as you drive. You quickly pass random gers in the countryside. 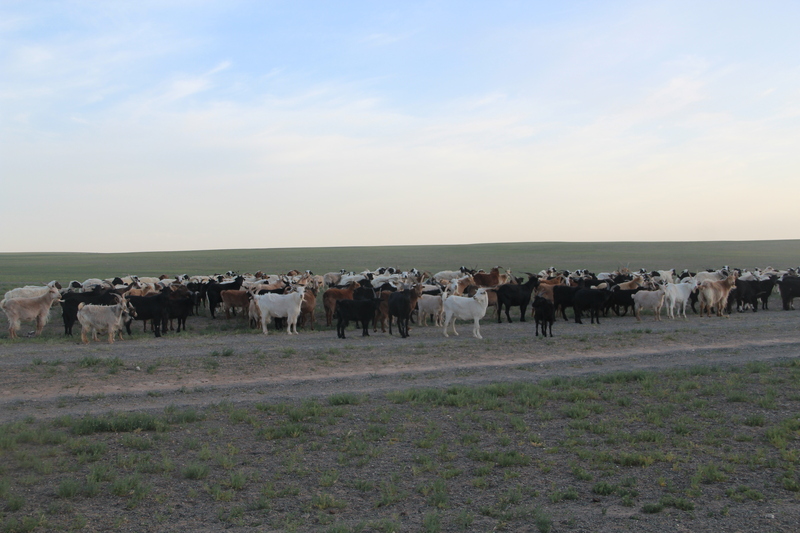 There are various herds ranging anywhere from 100 to 1000 animals consisting of sheep, goats, cows, horses, camels (sometimes) and supposedly yaks. The animals are always looking for the green grass and water. The gers appear basic on the outside and some people have two gers. Gers are very basic structures that can be taken down and put up in 2 hours. Outside of many gers, there is often a motorcycle to help herd the animals. Some of them even had a car to help with moving. They live out in grass in summer and then move either to the village or into mountains in the winter. The winter can be brutal and in 2010 – 17% or 8 million animals died in the winter. We finally arrived at our camp around 9. We were pleasantly surprised. It had a hot shower and nice looking bed. We showered up and ate around 10. It was our first of many meals of mutton and cabbage/cole slaw type mixture. 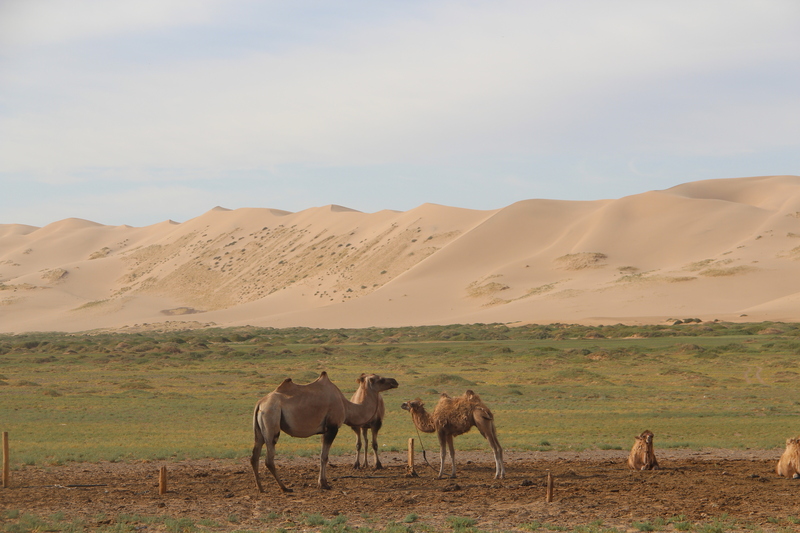 The next day we were heading to the sand dunes. 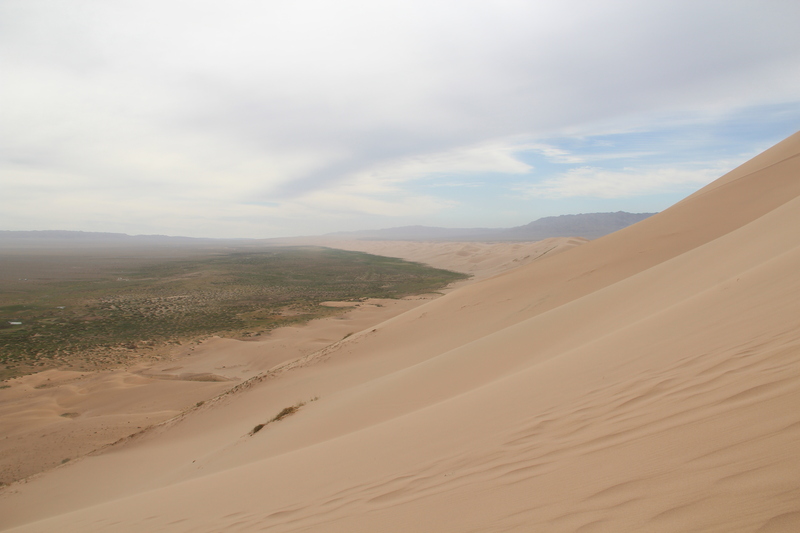 Little did we know, but the sand dunes were located all around our camp. We reached the dunes at around 8:30 where we met with a local family that owned the camels that we would be riding after hiking up the dunes. We were joined in the ger by 3 other Americans. I had my first experience with airag, mares milk, and it was nasty. I gagged but did not throw up. We were ready for the dunes. I was determined to get to the top assuming that I didn’t hit any barriers. I was concerned for my 68 year old father, who isn’t exactly running any marathons. The hike was very steep. My father quickly realized his limits and stopped. I continued to push up with the other Americans stopping at various points. The view was amazing on the dunes the higher that I reached. We hiked without shoes to make the climb easier. I hiked along the ridge until I heard someone shouting. I turned around to hear my father telling me/ begging me to stop as I was all alone on my way to the top of dune. I was probably 80% of way to top but stopped to appease my Dad. I will never know what was on the other side. I then had the pleasure of running down the dune. What took me 30 minutes to get up took only 30 seconds to get back down. We were now ready for our camel ride. My father and I wee the first ones up. These camels have two humps. If a hump is pointy, it means that the camel is well rested and has had lots of water. From the look of the camels humps, these guys were ready. 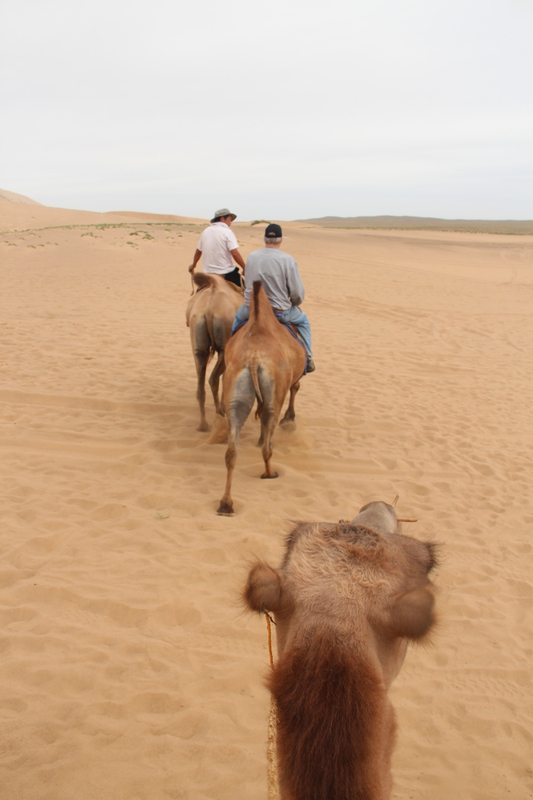 These camels can carry up to 600 pounds so we were fine. We were on camels for about 45 minutes. My camel would stop at various times where I would need to go chu chu to get it going. I also found out it interesting when it would lean its head back and scratch its hump. It was a cool experience to share with my father. Before leaving, we also got the opportunity to see the family milk the mare. It was interesting that they did it every 2 hours. Luckily, they didn’t make us have another sip. We were now ready for the three hour drive to the flaming cliffs. We zipped back through the grasslands and a mountain pass. Our guide decided to make a impromptu stop at a local ger. We went inside to see grandma, daughter (? ), and three kids. Since we didn’t have translator, it was a bit awkward. The kids stared at us like we were aliens. I tried to keep drinking tea in fear of being given airag. We were also given some hard bread that was pretty good as a snack. The family had a TV, phone, and refrig in their ger. They were living the dream. As we departed, we gave the family some pens, which they looked happy to receive. It was a nice experience, but I will always dread the airag. We then make it to the flaming cliffs. The flaming cliffs were where dinosaur eggs were discovered for the first time in the 1920s by an American paleontologist. When we approached the flaming cliffs, we didn’t see cliffs above us but we saw them below us. It was really cool to see the contrast between the flat grasslands and the rise of the cliffs. The red of the cliffs was amazing. We hike all around the topic cliffs for an hour. We once again ran into our American friends on our journey. After the flaming cliffs, we had another drive for an hour to our ger camp. It again was very nice. We got to eat some buzz, which is like mutton dumplings. Unlike our last ger, this ger was packed with a group of 20 seniors from the states. I think my dad still had a couple years to go until he would have blended with them. I was also a hero to a local for fixing her Android phone by simply turning it off and then on. The next day we woke up to rain. 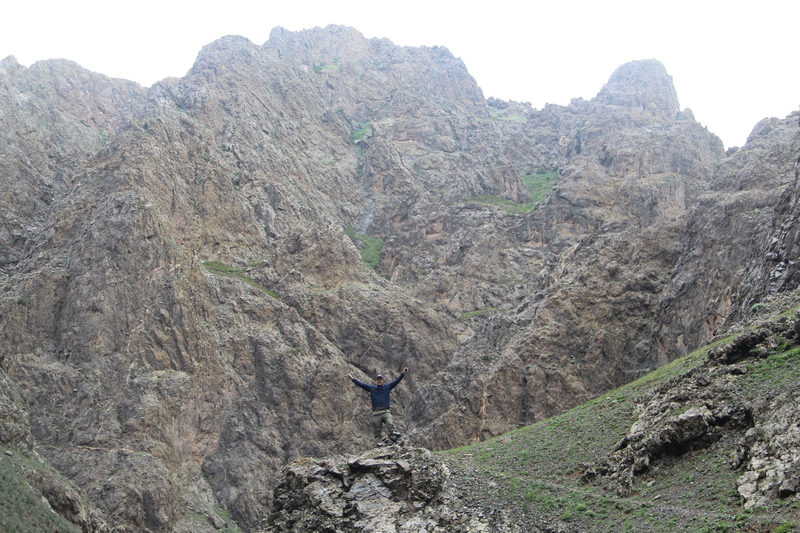 We had an hour drive to Yoly am, but we again made a quick stop to a local ger. Once again, I feared drinking the airag. They served us yogurt that my dad enjoyed, but I passed on it. It was too sour. After about 20 minutes, we went to Yoly am. As we arrived, the rain finally began to stop. My dad and I were the only two at the place. Yoly am is know for ice canyons. 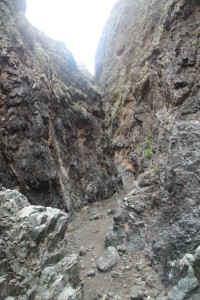 Ice can be found in canyons well into June. The canyon was beautiful. We more or less had the canyon to ourselves. After checking out the canyon, we headed to Dalanzag. On the way there, we saw tons of cars parked for the horse racing in the local nadaam. It was pretty cool. The race is 17 km long so it is really only last couple of minutes that are exciting. The race primarily celebrates the trainer and the horse and secondarily the jockey. The top 5 people are awarded medals. It was also great.